Dr Sandhya Rao is currently Executive Director of INRM Consultants, New Delhi, an incubatee company established through the Technology Business Incubator Program of the Indian Institute of Technology (IIT), Delhi. She has been working in the area of water resources and natural resource management for more than 25 years, focusing extensively on issues related to climate change. Her areas of expertise include hydrological and hydraulic modelling and climate change impact assessments in the water, agriculture, and health sectors, including vulnerability and risk assessments. She has several internationally and nationally published papers. 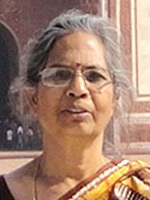 She holds a doctoral degree in water resources from the Indian Institute of Technology, Delhi.